It's a bacterial pathogen responsible for 45,000 infections yearly in the U.S. 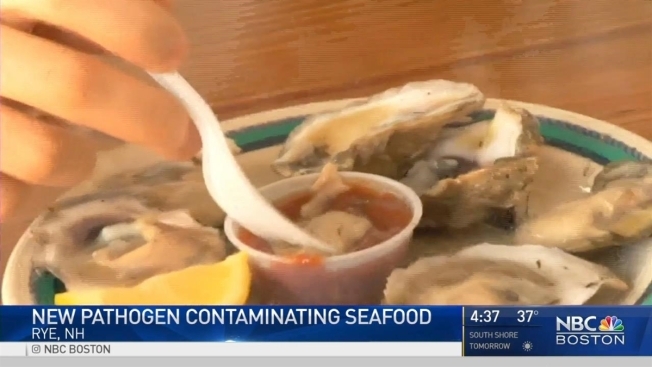 Researchers at the University of New Hampshire have identified a bacterial pathogen found in seafood along the Atlantic coast. "Vibrio parahaemolyticus it's called," said Cheryl Whistler, associate professor of molecular, cellular and biomedical sciences and Director of the Northeast Center for Vibrio Disease and Ecology at UNH. "We actually started identifying the strain over a decade ago now in New Hampshire, where there have been no illnesses," said Whistler. Low levels of the bacteria pose little health risk. If you consume thousands of strains by eating undercooked or raw shellfish you could get sick. "Very bad stomach ache, vomiting, sometimes they will have diarrhea and sometimes bloody stools," said Whistler. "It can be quite severe and last for several days." Researchers at UNH along with the FDA, Massachusetts Department of Public Health in Boston and many other agencies identified the strain using clinical cases. They found that Vibrio parahaemolyticus reoccurred in most cases of illness. "It's causing infections as far north as Prince Edward Island and as far south as the coast of Florida," said Whistler. The owner of Seaport Fish in Rye, New Hanmpshire, Rich Pettigrew, said shellfish should be kept cold. "For our spec we like it under 40 degrees," said Pettrigrew. This reduces bacteria levels. "If there was a break out and people were to get sick we would be able to trace that all the way back to the harvest area," said Pettrigrew when describing how the shellfish is tagged by fishermen. The bacterial pathogen is also found in the Pacific. Warmer waters are a factor but there is a way to decrease the bacteria. "Grow them in an estuary and then physically move them to a site offshore where it's colder," said Whistler. "Where there's fewer bacteria. Where it's higher salinity." Researchers said cooking the shellfish kills the bacteria but if you enjoy it raw you want to get it from a reputable place. They also recommend avoiding raw shellfish if you have a weak immune system or suffer from liver disease.